James Abbott McNeill Whistler, Milly Finch (1883-4), watercolour on paper, 29.8 x 22.5 cm, Freer Gallery of Art, Smithsonian Institution, Washington, DC. WikiArt. Of all the painters covered in this series so far, Whistler is probably the best known today, although I must admit that he is not a particular favourite of mine. Unfortunately he often painted using ‘special’ home-made media which appear to have made some of his paintings look very dark and drab now, and are posing conservation problems. This was also not helped by his preference for poorly lit motifs. In spite of the difficulty in seeing his paintings now as they perhaps were intended to be, he is of great historical importance, as an American who spent most of his working life in London, but had studied at the same Paris art academy as several of the French Impressionists. Born in Lowell, Massachusetts, as James Abbott Whistler, in 1834, he moved with his family to Saint Petersburg in Russia in 1843, where his father was involved in engineering the railway to Moscow. Having taken classes at the Imperial Academy of Fine Arts since the age of 11, he was sent to West Point, the military academy on the Hudson River, NY, from 1851-4, following which he learned to etch whilst working in the US Geodetic and Coast Survey. He left the US in 1855 for Paris, where he became a pupil at the Gleyre Academy. (This was seven years before Monet started at the same academy.) He arrived in time to visit Courbet’s pavilion outside the Universal Exposition, and immediately became influenced by him. In 1858 he produced a set of etchings from a walking tour of Alsace-Lorraine and the Rhineland which were well received. Surprisingly several of the paintings of his which survive from this period show loose brushwork which would not have been well received by Marc-Charles-Gabriel Gleyre. He also established a reputation for himself as a dandy who enjoyed the high life. 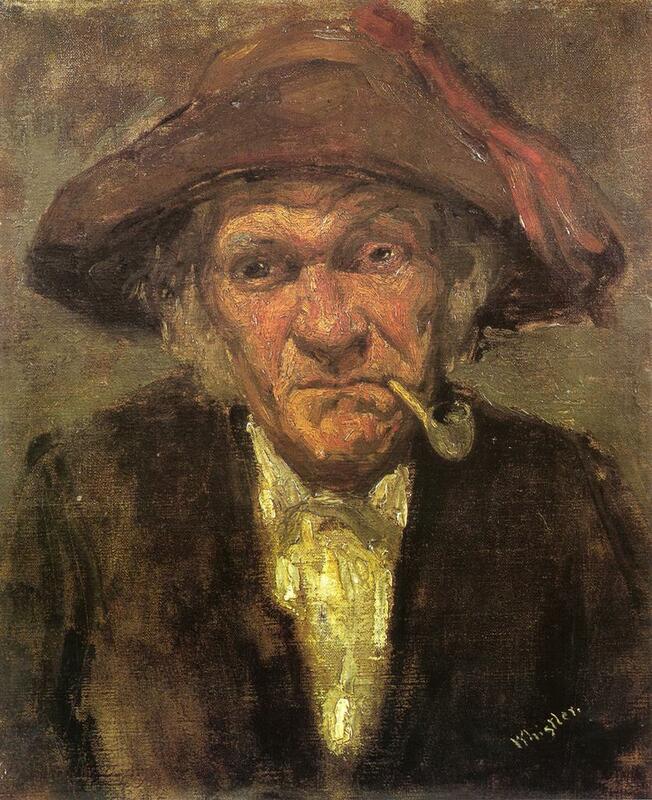 James Abbott McNeill Whistler, Head of Old Man Smoking (c 1858), oil on canvas, 41 x 33 cm, Musée d’Orsay, Paris. WikiArt. 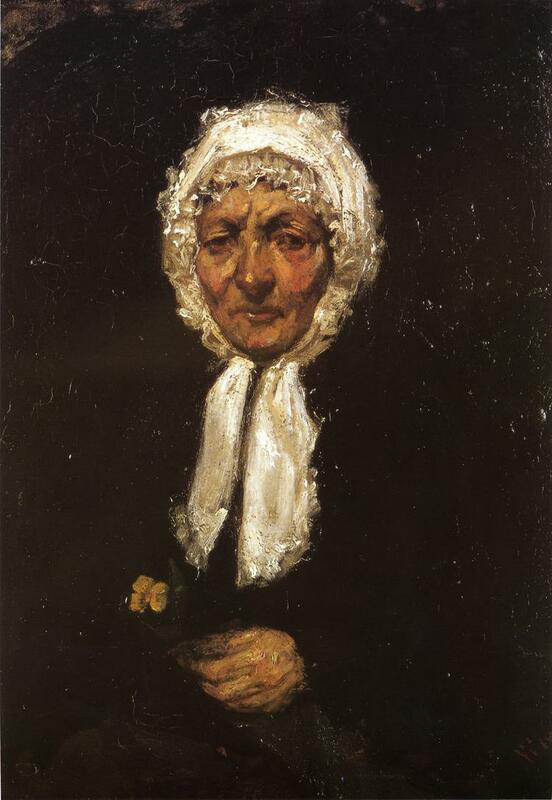 James Abbott McNeill Whistler, Old Mother Gerard (1858-9), oil on canvas, 30.48 x 21.91 cm, Private collection. WikiArt. He then moved to London in 1859, where he kept his studio until 1892. In 1862 he travelled to Brittany to paint, then spent the winter in Paris. He met and started to live with Joanna Hiffernan, his model for Symphony in White No. 1: The White Girl. That painting was rejected by the Royal Academy in 1862, and widely criticised for showing a woman in white against a white background. Whistler showed it the following year at the Salon de Refusés in Paris, where it appeared with Manet’s Déjeuner sur l’Herbe, and shared the scandalous reaction. Hiffernan later posed for one of the two nudes in Courbet’s Sleepers. 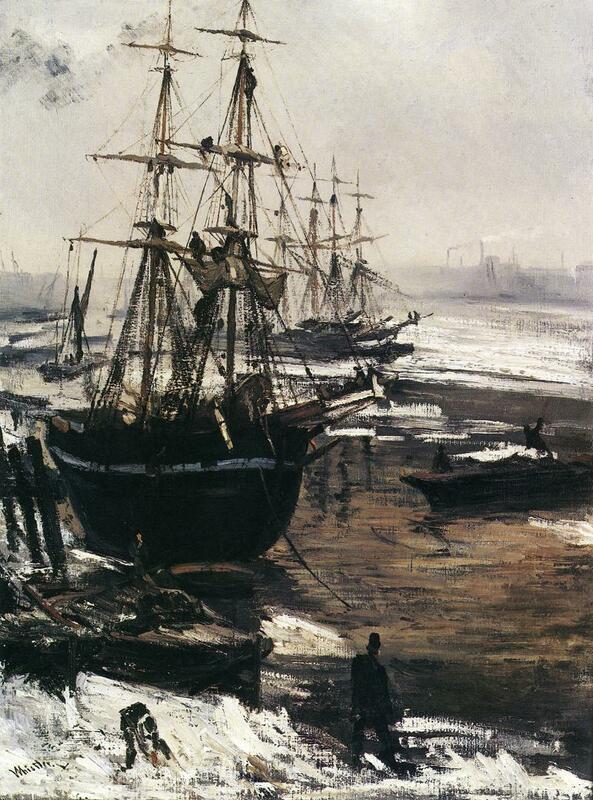 James Abbott McNeill Whistler, The Thames in Ice (1860), oil on canvas, 74.6 x 55.3 cm, Freer Gallery of Art, Smithsonian Institution, Washington, DC. WikiArt. James Abbott McNeill Whistler, Symphony in White No. 1: The White Girl (1862), oil on canvas, 214.6 x 108 cm, National Gallery of Art, Washington, DC. WikiArt. 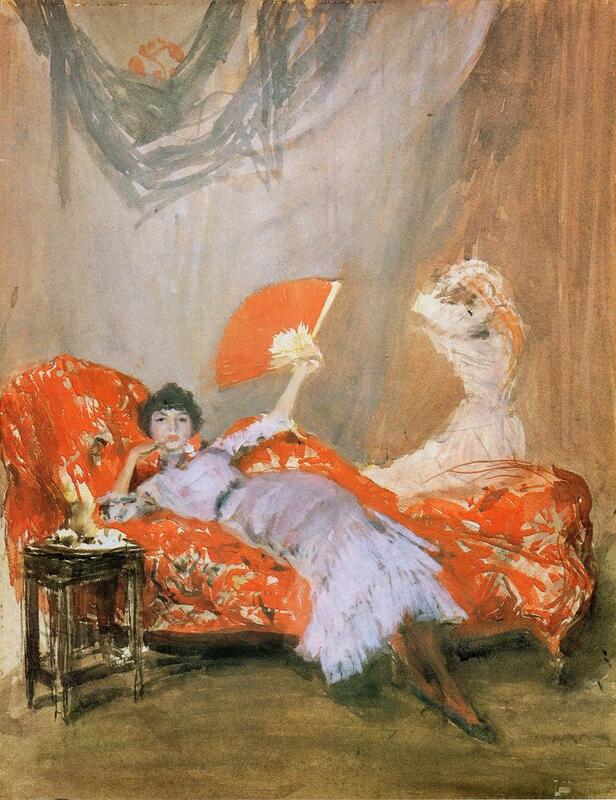 In 1863 Whistler’s widowed mother arrived to live with him in London, until 1875, curbing some of his social excesses. He befriended some of the Pre-Raphaelites, and became influenced by orientalism, which he had been introduced to by Fantin-Latour and Bracquemond when a student in Paris. 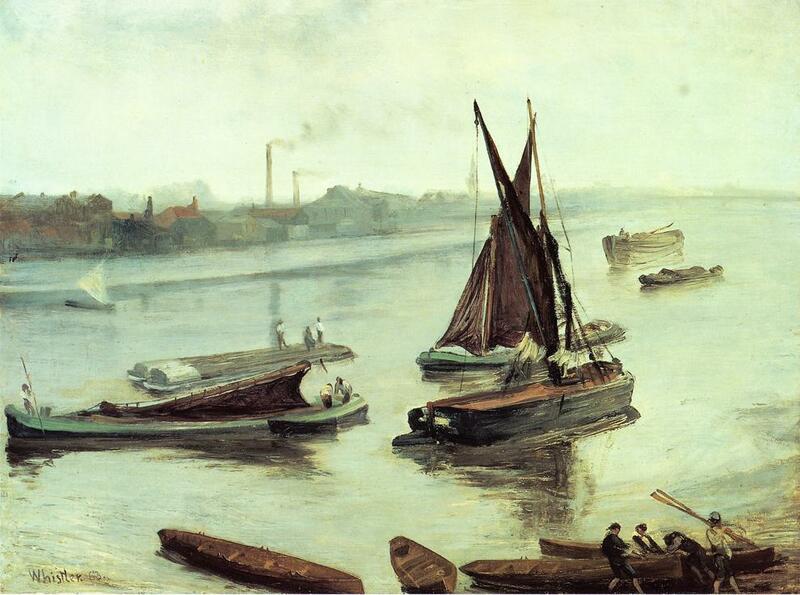 His friendship with the Greaves brothers encouraged him to paint views of the River Thames in London. 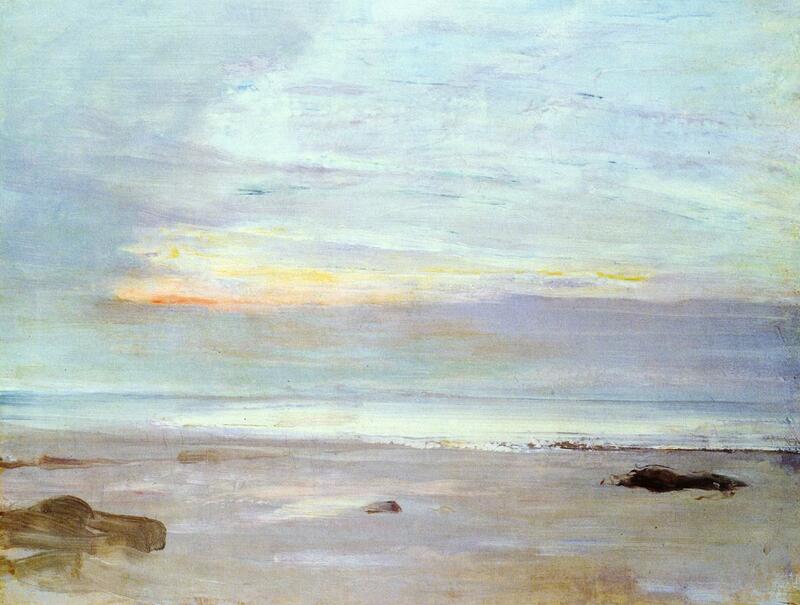 In the autumn of 1865 he painted at Trouville, France, with Courbet. James Abbott McNeill Whistler, Grey and Silver: Old Battersea Reach (1863), oil on canvas, 50.8 x 68.6 cm, Art Institute of Chicago, Chicago, IL. WikiArt. 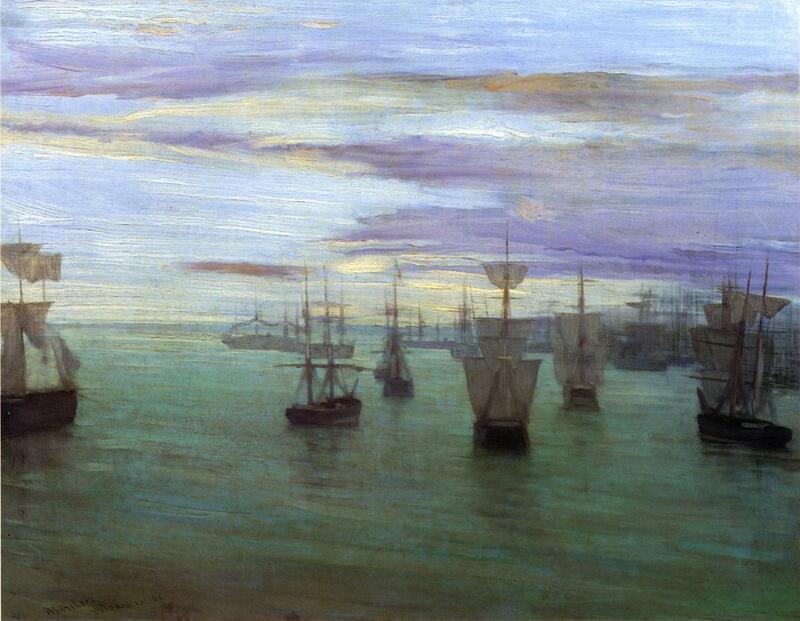 James Abbott McNeill Whistler, Crepuscule in Opal: Trouville (1865), oil on canvas, 34 x 45.7 cm, Toledo Museum of Art, Toledo, OH. WikiArt. In 1866 he was invited to go to Chile, where there was a war involving Spain. Although he avoided involvement in any conflict, he painted and kept a detailed journal. James Abbott McNeill Whistler, Crepuscule in Flesh Colour and Green: Valparaiso (1866), oil on canvas, 58.4 x 75.5 cm, The Tate Gallery, London. WikiArt. James Abbott McNeill Whistler, Symphony in White and Red (c 1868), oil on canvas, 46.67 x 61.91 cm, Freer Gallery of Art, Smithsonian Institution, Washington, DC. WikiArt. In 1869 he met the Liverpool shipowner, Frederick Leyland, who became a patron. He started painting a series of nocturnes, along the River Thames, in 1871. James Abbott McNeill Whistler, Variations in Pink and Grey: Chelsea (1871-2), oil on canvas, 62.7 x 40.5 cm, Freer Gallery of Art, Smithsonian Institution, Washington, DC. WikiArt. James Abbott McNeill Whistler, Nocturne in Black and Gold: The Falling Rocket (1875), oil on wood, 60.3 x 46.6 cm, Detroit Institute of Arts, Detroit, MI. WikiArt. Whistler’s mother moved to Hastings for health reasons in 1875, allowing him to start entertaining lavishly. The following year he was commissioned to decorate the Peacock Room in Leyland’s London mansion, which unfortunately ended in acrimony after a couple of years, and loss of Leyland as his patron. 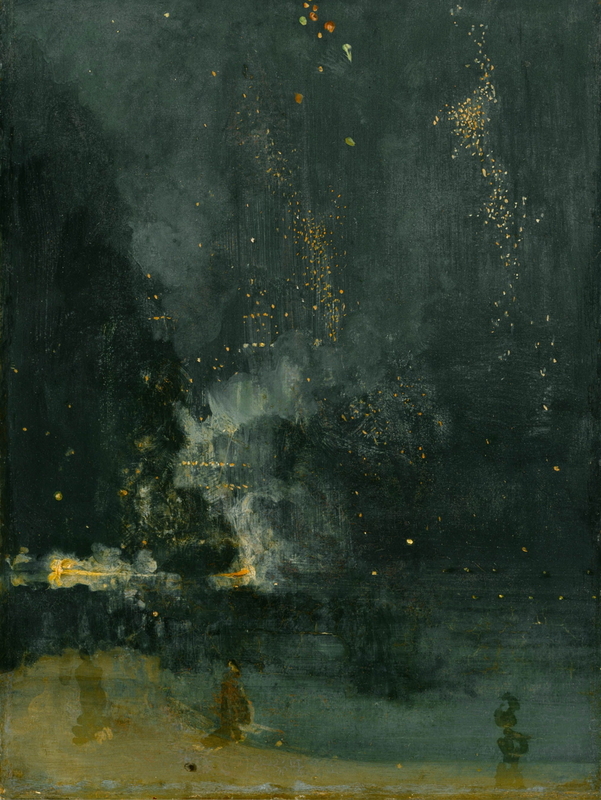 In 1877, eight paintings of his, including Nocturne in Black and Gold: The Falling Rocket, were shown at the opening exhibition of the Grosvenor Gallery, London. These caused a furore among critics, particularly John Ruskin, who published a scathing account in protest. 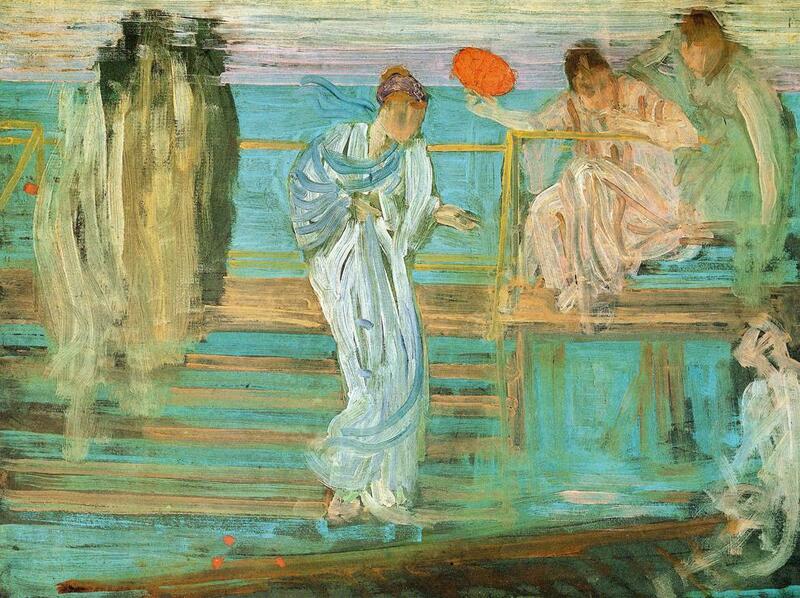 Whistler then sued Ruskin for libel. Although Whistler won the libel case, he was awarded a farthing (0.6 pence) in damages, and his legal costs bankrupted him in 1879. He fled to Venice for a year, commissioned to make a series of etchings there. James Abbott McNeill Whistler, Harmony in Pink and Grey: Portrait of Lady Meux (1881-2), oil on canvas, 103.7 x 93 cm, The Frick Collection, New York, NY. WikiArt. His etchings from Venice were exhibited at the Fine Art Society in 1883. He then visited St Ives, Cornwall, in 1884 in company with Mortimer Menpes (his assistant) and Walter Sickert. There he painted mainly small seascapes, and back in London he painted several works showing shop fronts. With reviews of his work steadily improving, he was elected President of the Society of British Artists in 1886. He at last enjoyed critical success with a one-man retrospective exhibition at the Goupil Gallery, London, in 1892, but then moved to Paris for two years. He started to concentrate more on creating lithographs. He visited Paris from 1898 to teach at an art academy opened there by one of his former models, Carmen Rossi, until it closed in 1901. The academy’s sole success seems to have been Gwen John (1876-1939). He died in 1903. 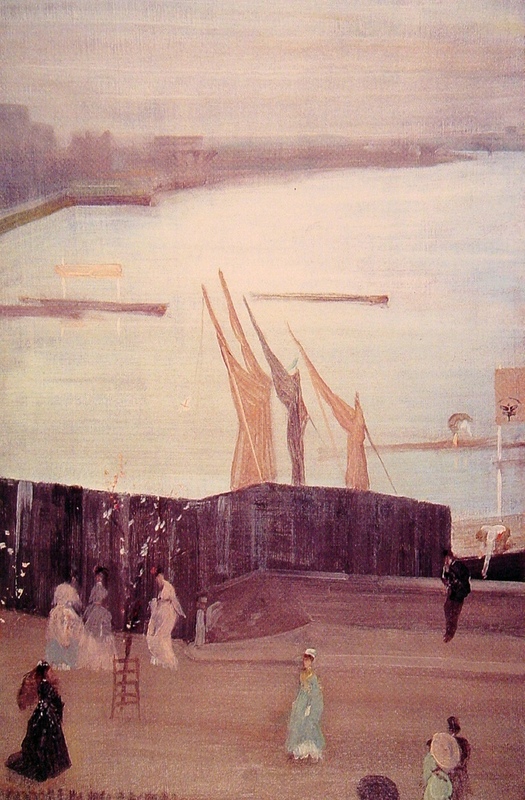 Whistler developed a unique style which had much in common with the Impressionists. Before they had emerged from Barbizon or realist styles, he was using very loose brushwork and a facture similar to that used by Impressionists much later. However he never made the same use of bright colours, and few of his paintings are as rich with light. He was strongly influenced by orientalism or japonisme, as later became popular among the French Impressionists. In this sense he was a pre-Impressionist who anticipated several of the key features of Impressionism. Posted in Painting and tagged Courbet, Fantin-Latour, Gleyre, Impressionism, japonisme, orientalism, painting, Ruskin, Sickert, USA, Whistler. Bookmark the permalink.